This past decade’s resurgent interest in practical urban bicycling has seen an exponential growth in bike commuting, numerous high-profile bike-lane projects and even a so-called “bike mayor” of Seattle. With the increased enthusiasm for bikes, however, has come corresponding controversy and outcry, from motorists and pedestrians alike. If recent viral GoPro video footage of profanity-laden exchanges between cyclists and non-cyclists serves as any indication, it would certainly appear as though today we are experiencing something of a car-versus-bike moment in Seattle and across the country. But as James Longhurst’s “Bike Battles: A History of Sharing the American Road” makes clear, this friction predates even the automobile itself: It was at least as early as 1883, when the first “Get that thing off the road!” was hollered, from a New Jersey horse-drawn wagon driver to a cyclist. 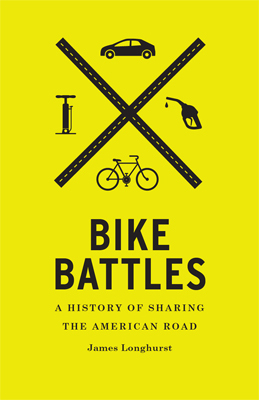 “Bike Battles,” published in April by University of Washington Press, outlines the ongoing public debates between American bike riders, motorists and pedestrians over the shared road, from the 1870s through the 1970s. It’s an issue as polarizing as it is perennial, and Longhurst, professor of history at the University of Wisconsin-La Crosse and self-described bike commuter and cycling advocate, discloses his potential bias in his preface: “I have a stake in this topic because I wish to avoid being run over.” Nevertheless, the author manages to reign in his personal opinion, focusing instead on government actions that have influenced practical bicycling in American cities through the decades. Roughly speaking, the story begins in 1879, the year a pivotal court ruling declared a bicycle a vehicle with equal rights to the public road. The legal decision afforded little concrete protection for cyclists on the road, however. Stories abound, such as the 1891 Chicago Daily Tribune description of grumpy farmer Absalom Wycoff, who had a well-documented tendency to horsewhip cyclists in the road who failed to make way for his wagon (ultimately, Wycoff picked on the wrong cyclist, who jerked him out of the wagon, blacked his eyes and belabored the squirming Wycoff with his own whip). Indeed, more than a century of wrangling over the place of bikes would follow, including discussions of taxes, regulations, sidepaths and road-planning. The advent of the automotive age, as well as “scorchers” — a 19th-century term for those reckless, fast-pedaling cyclists who some readers may still recognize on the streets of Seattle today — introduced the need for bike-specific traffic laws, the evolution of which is still very much in progress. In chronicling the ongoing public conversation about the bicycle, Longhust draws upon primary legal and political sources. But he also frequently incorporates documents and images from pop culture, including educational films from the 1950s, cranky letters to the editor in small-town newspapers, Boy Scout merit-badge pamphlets and sitcoms. These colorful references, coupled with Longhurst’s light and natural writing style, make “Bike Battles” easy to read. As Longhurst traces the history of bike policy, he also explores the shifting cultural perspectives on the bicycle along the way. What the bike signifies to the American imagination — child’s toy or technological marvel? Fad of an elite or marker of poverty? — plays a crucial role in shaping political actions to come. Longhurst’s “Bike Battles” illustrates how the bicycling renaissance and concomitant “bike-lash” of the present-day is hardly a new or isolated conflict —it is rather a continuation of a thorny, complex confrontation more than 125 years in the making. James Longhurst will discuss and sign “Bike Battles: A History of Sharing the American Road” at a free event at the Seattle Public Library’s Central Branch (1000 Fourth Ave.) on June 20 at 3 p.m.
JOE GARVIN is a member of the events staff at University Book Store (www.bookstore.washington.edu) in the University District. To comment on this review, write to CityLivingEditor@nwlink.com.